Welcome to sutrotower.org, a comprehensive guide to Sutro Tower and Mount Sutro in San Francisco, California by David July. Enjoyed by locals, visitors to the city and others worldwide, sutrotower.org has been referenced in publications such as the San Francisco Chronicle, The Washington Post, Wired, Macworld/PCWorld, The SF Appeal, Curbed SF, Laughing Squid and Burrito Justice. I hope that you will find this resource interesting and informative. You are invited to contribute your stories, photographs, news, updates, corrections and links by email. Thank you for visiting! All your Sutro Tower are belong to us. David July and sutrotower.org are not affiliated with Sutro Tower, Inc.
Sutro Tower is a 977-foot (297.79-metre) self-supporting steel structure in San Francisco, California built to provide public, private and governmental communications services such as radio and television despite the region's hilly topography. The base of Sutro Tower is 834 feet (254.20 metres) above mean sea level. The total height of the tower is 1,811 feet (551.99 metres) above mean sea level, with an antenna height above average terrain of 732 feet (223.11 metres). Including the earth below it, the three-pronged tower is the highest and most visible structure in the San Francisco Bay Area. The physical address of Sutro Tower is 1 La Avanzada Street, San Francisco, California 94131-1124, however the historical address 250 Palo Alto Avenue, San Francisco, California 94114-2123 is still occasionally listed on official government documents. The tower stands at about 37° 45' 19" North latitude and 122° 27' 10" West longitude (37.755278, -122.45277), placing it just southeast of the Mount Sutro peak on an adjacent and connected hill that may be considered Clarendon Heights. The 5.60-acre (2.27-hectare) fenced private property known as Assessors Block 2724, Lot 3 includes the tower, 31,000-square-foot (2,880-square-metre) transmission building designed by Neill Smith and Associates, a garage and storage building, guard station, diesel-powered emergency generators, two underground diesel storage tanks in concrete vaults for leak containment, ancillary antennas, assorted equipment and a paved, striped parking lot for twenty-three automobiles. Sutro Tower is owned and operated by Sutro Tower, Inc. (STI), an independent corporation founded in 1968 by the owners of local stations KTVU 2 (then Cox Enterprises now Fox Broadcasting Company), KRON 4 (then Chronicle Publishing now Media General), KPIX 5 (then Westinghouse Broadcasting now CBS Corporation) and KGO-TV 7 (then American Broadcasting Company now Disney-ABC Television Group). The owners hold equal shares in the corporation, which owns the tower and leases antenna space to broadcasters and other telecommunications clients. Pricing is reportedly adjusted for community stations like KQED 9 (Northern California Public Broadcasting) and KMTP 32 (Minority Television Project). Eric Dausman is the current general manager of Sutro Tower, joining the staff on Monday, 06 April 2009 as vice president and successor to Eugene S. Zastrow. Following a six-month transition period during the digital television (DTV) conversion project, Zastrow retired in October 2009 after working at the tower since 1992. Before moving to San Francisco, Dausman spent eighteen years as director of technology at KGW-TV (Sander Media) in Portland, Oregon and also managed a local tower company. Before antennas appeared on the hilltop connected to Mount Sutro, the site was home to the Sutro Mansion "La Avanzada" built in 1935 by aviator, adventurer and writer Adolph Gilbert Sutro (1891–1981), grandson of original land owner Adolph Heinrich Joseph Sutro. Designed by architect Harold G. Stoner and built for $250,000, the mansion featured large, wood-beamed rooms with tile and stained glass ornamentations. The three-story La Avanzada mountain villa served as home to Adolph Gilbert Sutro and his mother Henrietta L. B. Sutro for about eighteen years, until they decided to relocate to property in Mission San Luis Rey de Francia (modern Oceanside, California). The house and surrounding land were sold for $125,000 in 1948 to ABC for use by their new KGO-TV television station. KGO-TV installed transmitters, fashioned a studio and built a 580-foot (176.80-metre) broadcast tower next door. Signing on the air on Thursday, 05 May 1949, fifty employees produced the first show broadcast on KGO-TV from the Sutro Mansion studios and tower. About two years later, competitor KPIX-TV and several FM radio stations began renting space on the tower — the beginnings of a trend that would shape the future of the site. In 1953, KGO-TV moved into new downtown studios at 277 Golden Gate Avenue but the mansion continued to serve as the transmitter site. By 1956 however, the broadcasters decided that a taller antenna was required to cover the hill-constellated terrain. As the first plans for what would become Sutro Tower were being developed in 1957, the Federal Aviation Agency (FAA, known today as the Federal Aviation Administration) was also reviewing options for an alternative site for a new transmission tower to serve the area. News of the tower's plans started receiving public attention in 1962 as the FAA held hearings on the site options. During these proceedings, KGO-TV owner ABC strongly lobbied for approval of their plans for the Sutro Mansion location, while KRON-TV owner Chronicle Publishing pushed for a site on San Bruno Mountain where they had land interests. Perhaps acting to bolster support for their plan, the San Francisco Chronicle started publishing stories of neighborhood opposition. "What would happen should a Mount Sutro tower fall down? There's a new grade school within a thousand feet of that tower." After the FAA rejected the San Bruno Mountain site in 1962 due to its proximity to San Francisco International Airport (KSFO), years of political wrangling, litigation and alleged media suppression would follow. In March 1966, ABC asked the San Francisco Planning Commission for a conditional use permit for tower construction at the Sutro Mansion site, an area zoned residential. Leading up to the commission's public hearing on the permit request, ABC held two town meetings and invited residents to come learn about and discuss the tower's plans. During these meetings, KGO-TV General Manager David M. Sacks warned homeowners that ABC would likely sell the Sutro Mansion property to land developers if the tower could not be built there, implying that the existing open space would be destroyed. For example, Sacks characterized the options as "a tower in a park" and "no tower with no park" to the audience gathered at Clarendon School during the Wednesday, 02 February 1966 meeting. When the matter was heard before the planning commission and its president Ronald Pelosi on Thursday, 10 March 1966, ABC lauded their public outreach efforts and proclaimed a lack of neighborhood opposition. At the same meeting, Chronicle Publishing's attorney Robert Raymer of Cooper, White and Cooper countered by saying, "this structure is not the kind of structure that we in this beautiful city or the country or perhaps the world should have in our midst." The commission voted unanimously to grant the conditional use permit in Resolution 5967, a move that Chronicle Publishing appealed to the Board of Supervisors where Pelosi was now also serving as president. During his arguments to the board, Raymer claimed that the "outlandish tower […] would make an industrial area of the Mount Sutro residential area" and argued that ABC's testimony to the planning commission was false. Raymer said that the tower would have to be painted in alternating orange and white stripes, a statement which contradicted ABC's earlier claim that the tower would be painted a neutral color. ABC attorney Gilbert C. Wheat, senior partner of Lillick, McHose, Wheat, Adams and Charles, denied this accusation telling the board that "it is ridiculous to assume the [Federal Communications Commission (FCC)] will require the entire tower to be painted with alternate stripes of white and orange" and reiterating the earlier position that the tower "will doubtless be painted a neutral color consistent with the surroundings." On Monday, 16 May 1966, the Board of Supervisors voted on the appeal six to four against the tower, failing to meet the unanimous threshold required to override the commission's earlier decision. Coverage of the decision in the San Francisco Chronicle was a short, one-column piece on page forty-two. Beyond a magazine article in December 1967, not much else was published about the tower until September 1970. Apparently admitting defeat, Chronicle and KRON joined with the owners of KGO, KPIX and KTVU to form Sutro Tower, Inc., California corporation C0545215 filed on Friday, 03 May 1968. Two years later in September 1970, the planning commission held a hearing to approve the tower's final plans. Notwithstanding his previous arguments against the tower on behalf of Chronicle Publishing, attorney Robert Raymer this time urged the commission to approve the plans for construction. The new design with a wider top, broader waist and no platform differed significantly from the original plans approved in 1966, although the paint scheme requirement was clearly indicated. Due to the changes and the original permit expiring after three years, a new permit and public hearing should have been required in 1970. When the planning commission met on Thursday, 10 September 1970 and discussed the matter, Planning Director Allan Jacobs apparently said that he could not recommend the project, but felt that they could not say no after the commission's earlier approval. With that, final approval was given and the $4,000,000 Sutro Tower project was officially allowed to proceed. Unfortunately, the approval language included a provision that required the Sutro Mansion to be razed during the project. The city cited fire hazards and trespassing vandals as the reasons for the prerequisite. A few interior artifacts were salvaged prior to demolition, but the remainder of the house would be torn down. As the first stages of the project got underway, a number of permits were applied for and issued. A site permit was granted in December 1970, followed by a steel erection permit in February 1971 when construction formally began. Additionally, a building permit was issued in March 1971. By the summer of 1971, Sutro Tower was getting ready to rise above the city and start on a journey that has been described as from eyesore to icon. The project reportedly proceeded with little media coverage, likely due in part to the station owners' interests in the new transmission facility. As public awareness grew with construction underway, several lawsuits were filed in an attempt to stop the tower. In one such case, the judge denied the lawsuit on the basis that the plaintiffs should have protested when one of the three permits were issued. It is unknown how they would have been aware of them though, given the apparent dearth of media coverage. Several city officials are also said to have met privately with station owners to ask them to stop the project voluntarily. They declined. Sutro Tower was designed by Furman L. Anderson, Jr., engineer and vice president for Kline Iron and Metal Co. of Columbia, South Carolina (now Tower Innovations), and Albert C. Martin and Associates of Los Angeles, California. Kline was also responsible for the fabrication and erection of the tower. KGO-TV Chief Engineer Harry N. Jacobs, with the station since the 1950s, was assigned to the project as director of engineering and was effectively on loan from KGO-TV for a few years. Fellow KGO-TV broadcast engineer Michael R. O'Shea was responsible for designing the Sutro Tower electrical system. Harry Jacobs' daughter Suzi Beatie was a child during this time. In addition to remembering a visit to the Sutro Mansion, she remembers her father's involvement with the big project. She recalls him being a (probably) typical engineer who simply believed that the tower was in everyone's best interest and who was frustrated by the political issues surrounding the project. With Jacobs testifying at hearings, meeting with neighbors, giving interviews and being quoted in the newspaper, Beatie remembers thinking as a child that her father must be an important man and can recall him building his own scale model Sutro Tower prior to construction. At least part of Jacobs' support for Sutro Tower came from his — and surely many others as well — belief that the growing hype about pay television was much ado about nothing. Having been a broadcast engineer his professional career, he could not fathom why anyone would pay for television when they could get it from "the tower" free of charge. Beatie believes that, were he still alive, her father would be shocked to see how much money most people pay for cable and satellite television today. "I think it's a reasonably attractive affair. It's all in the eye of the beholder. A lot of people are not happy with it. A lot of people are not happy with anything. I think it's quite attractive. It's quite a monument." Construction of Sutro Tower was completed in 1972, followed by the installation of the transmitters, generators and other broadcast equipment required to bring the site online. In May 1973 and leading up to the first transmissions, KGO-TV General Manager Russ Coughlan said that Sutro Tower, Inc. would be hiring a public relations firm to launch a promotional campaign aimed to inform the public about the tower and how to adjust their antennas to improve reception. Two months later on Wednesday, 04 July 1973, the stations began broadcasting their signals from Sutro Tower — 45 years, 9 months, 15 days ago. Possibly the first journalist to scale the tower for a report, reporter Belva Davis rode the elevator to Level 6 with photographer Dave Ambriz in 1973 to shoot a story for KPIX. She writes about the experience in her memoir "Never in My Wildest Dreams" wherein she describes the difficulty of shooting a news segment in the strong winds experienced at that height. At least until 1979, anyone looking down from here could see remnants of the Sutro Mansion's original foundation perimeter. Foliage and further development would later obscure this, however. Fortunately, several artifacts from the Sutro Mansion days still do remain. Photographs of the mansion and original KGO-TV broadcast tower from around 1951 now hang framed in the main office of the Sutro Tower building near some vintage equipment. Removed from the mansion's library prior to demolition, a large stained glass window panel is now backlit and on display between two vending machines: one with snacks and the other a Pepsi soda machine that amusingly dispensed a can of Diet Coke to me. The framed photos and stained glass panel are both are pictured earlier on this page. Outside of the Sutro Tower building, a section of outdoor walkway from the mansion was barely visible in 2009 and is perhaps by now completely covered by grass. Not far from there, part of the original KGO-TV broadcast tower's concrete base is still intact and visible. Not only a monument of sorts to a bygone broadcast era, the original tower base is now used by tower crews to secure to the ground the rope and pulley systems used to lift equipment up the tower. Sutro Tower's FCC Antenna Structure Registration (ASR) number is 1001289, File Number A0122425. Sutro Tower, Inc. holds FCC Registration Number 0006161137 and FCC License ID L00232792. A small, two-person lift in the western leg of the tower provides access to the upper levels. Whatever equipment that does not fit in the elevator must be lifted up the tower via a rope and pulley system. To meet the one-to-two-million watt power requirements of Sutro Tower, utility Pacific Gas and Electric (PG&E) provides two 12.5 kilovolt feeds from separate substations. Pursuant to USDOT/FAA Advisory Circular AC 70/7460-1K , Sutro Tower is equipped with aircraft warning lights provided by Flash Technology of Franklin, Tennessee. Lamp replacements are installed about every two months according to Sutro Tower maintenance supervisor David Grimes in 2008. The lighting compliment includes twelve high-intensity white flashing obstruction beacons, nine medium intensity flashing red beacons, eighteen steady-burning obstruction lights and three red/white antenna beacons. The tower body is painted in alternating bands of Federal Standard 595 Color 12197 "Aviation Orange" and Federal Standard 595 Color 17875 "Aviation White" by D. Zelinsky & Sons of Brisbane, California. The tower is painted continuously to protect the steel from rust and corrosion, however the factory painted siding is not refreshed as often and does fade over the years. On a typical day, there are an average of seven (four to ten) employees on-site with four working for Sutro Tower, Inc. and the others their respective broadcasters. Staff for each station take their programming signals as received by microwave or fiber optic cable and then process and amplify them for public broadcast. Station staff also work at the tower to conduct equipment maintenance, repairs and tests. Certain maintenance can only be performed while the main antennas are powered off, allowing workers to ascend the tower and work in close proximity to the antennas. During these times, the stations often switch to their auxiliary antennas and continue broadcasting. Like all structures in the Bay Area, Sutro Tower was designed to withstand seismic activity. Part of that design includes engineering the tower's center of gravity below ground, accomplished by the physics of the tower's approximate weight of 3,700,000 pounds (1,678 metric tonnes) in concert with the 15,000,000 pound (6,804 metric tonne) concrete foundation into which it is built. Additional upgrades to improve seismic resiliency were installed in 1991 during a $1,000,000 maintenance project that also repaired rust on the western, ocean-facing leg of the tower. With those upgrades in place, Sutro Tower was rated to survive an earthquake of 8.3 on the Richter magnitude scale. In 1997, Sutro Tower was designated as an essential facility by the City of San Francisco. Recognizing it as a key component of the city's emergency response plans to ensure the continuous availability of communications services, the designation means that Sutro Tower meets a higher level of structural codes and criterion than standard permits require. Concerned that work being done around the same time had more to do with the installation of a 10-ton digital television antenna rather than safety, local residents petitioned city officials to conduct additional safety reviews and require a full dynamic analysis using new data and techniques. As part of a broader campaign against the tower, residents at this time focused on their belief that the installation of digital antennas was not allowed per the conditional use permit originally granted. Beyond seismic safety, the other chief complaint from residents involved possible electromagnetic effects on humans. After attempting and failing to get the city to delay the Sutro Tower upgrades through a series of legal and political battles in 1998–1999 — a matter which was widely discussed by the local media — the coalition of residents were finally successful in persuading Sutro Tower, Inc. to take action. In August 1999, it was announced that Sutro Tower would adopt the findings of EQE International, Inc., an engineering firm whose June 1999 recommendations included the strengthening of 270 steel members and 110 connections. Engineers at EQE were then tasked with designing the retrofit, a "fairly significant job" according to General Manager Eugene S. Zastrow. The completed design and job specifications would then be put up for bid in January 2000. Further political dramas played out in 1999 and 2000. 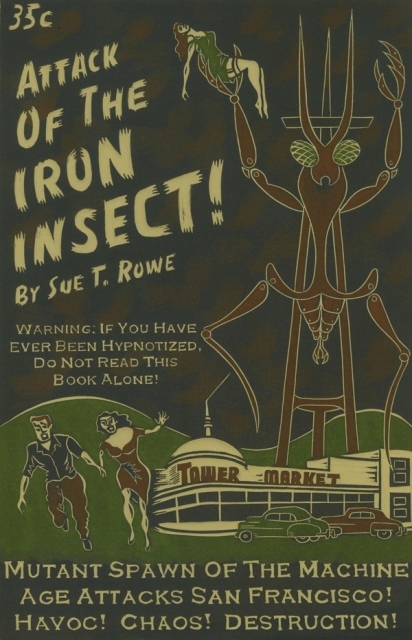 On Wednesday, 29 December 1999, city planning administrator Mary Gallagher resigned her post in a row over sending a letter to Sutro Tower requiring a special permit for 179 antennas that had been illegally installed over the past two decades and then rescinding it at the request of a lobbyist. During the Wednesday, 19 January 2000 meeting of the Board of Supervisors, a "testy exchange" between committee chairman Tom Ammiano and Sutro Tower representative Robert McCarthy resulted in the latter being ejected from the hearing room. Regardless on Thursday, 03 August 2000, the commission approved "the addition of more than 200 antennae to Sutro Tower" and "retroactively legitimized 176 antennae that were installed over the past decade." The ruling also "allows the addition of some thirty new or replacement devices." By September 2003, the four-to-six month seismic retrofit was underway by Kline Towers (formerly Kline Iron and Metal Co.) and Simpson Gumpertz & Heger, Inc. of Waltham, Massachusetts. Measurements to ascertain the radio frequency (RF) exposure levels at Sutro Tower are within FCC guidelines Docket 93-62 are taken every three years or when any digital antenna is activated or increased in power. Hammett & Edison, Inc. of Sonoma, California has conducted these exposure studies since at least 2006. The exposure study conducted on Friday, 30 June 2006 found the tower in compliance with the "requirements for limiting public exposure to radio frequency energy." The next exposure study conducted on Wednesday, 01 July 2009 of the auxiliary antennas found "the maximum ambient RF levels were well below the prevailing standard" at all points and that "the RF exposure levels at all but one of the twenty-six reference points are less than those measured" in June 2006. Following the completion of the DTV project, an exposure study of the main antennas was conducted on Tuesday, 24 November 2009. The results of measurements taken complied with the requirements of both the government mandated standards for RF energy exposure and the agreement with area residents made on Friday, 07 November 2008. The 2008 agreement between Sutro Tower, Inc., Midtown Terrace Owners Association, Twin Peaks Improvement Association and the Forest Knolls Neighborhood Association brought to an amicable conclusion years of fighting, disagreements and mistrust over an environmental impact review. Subsequent RF exposure studies conducted on Tuesday, 09 August 2011 and Wednesday, 06 August 2014 also found that "the TV and FM broadcast stations at Sutro Tower continue to comply with prevailing standards for limiting public exposure to radio frequency energy." Despite these studies and other science, some residents still worry about the tower and RF exposure. During the Wednesday, 06 December 2006 MythBusters "Holiday Special" episode, co-hosts Grant Imahara, Kari Byron and Tory Belleci paid a visit to Sutro Tower and the now retired Eugene S. Zastrow to test a theory about RF. The premise of the subject myth is that since microwave ovens use energy similar to that of broadcast towers, you should be able to cook food by placing it near an energized antenna. After declining the team's request to attach a turkey to Sutro Tower, Zastrow says he doubts that the experiment would work anyway. The team then tries a microwave transmitter atop a KRON-TV news van and a large radar aboard the World War II era S.S. Jeremiah O'Brien, but all tests fail to heat the turkey and the myth is "busted." "Microwave transmitters that the stations use are very low power. They're in the neighborhood of a couple of watts, as opposed to a microwave oven which is you know, seven, eight-hundred, even up to twelve-hundred watts of power. Plus, it's very confined." In addition to the regular RF exposure studies, Sutro Tower also receives an annual structural inspection conducted by an independent engineering firm. These annual inspections started in 1999 and from 2009 to 2012 were performed by CEL Consulting of Oakland, California. Since 2013, the inspections have been performed by Tower Consultants, Inc. (TCI) of Columbia, South Carolina under a Sutro Tower maintenance contract held by Simpson Gumpertz & Heger, Inc., who previously worked on the 2003 seismic retrofit. Following the TCI inspections, Simpson Gumpertz & Heger engineers develop and execute maintenance, repair and other plans to improve structural integrity. In October 2007, Sutro Tower began participation in the California Greenhouse Gas Emissions Project (CALGEM) run by the Lawrence Berkeley National Laboratory. Also part of the Cooperative Air Sampling Network, monitoring equipment and sample flasks were installed in September 2007 just above Level 3 at 400 feet (121.90 metres) and on Level 6 at 760 feet (231.60 metres). Twice daily, the equipment takes in air and transports it to the ground level for on-site carbon dioxide and methane analysis. Fifty gases, compounds and chemicals are currently monitored at the Sutro Tower data collection site (STR), the data from which is then analyzed at the NOAA Climate Monitoring and Diagnostics Laboratory in Boulder, Colorado on a weekly basis. There have been no significant incidents at Sutro Tower in its decades of operation. An incident of note did occur in the early morning hours of Sunday, 08 February 2009 when a transformer in one of the television station's equipment rooms overheated causing "a great deal of smoke" but no actual flames. Nevertheless, the fire alarm was triggered alerting the on-site guard and the security monitoring company who in turn called the San Francisco Fire Department. A large number of firefighting vehicles and apparatus were dispatched since the exact cause of the alarm was unknown at the time. The smoke dissipated once electricity to the transformer was cut, also taking offline the equipment which it powered. The fire department's investigation was completed in about an hour-and-a-half. "It's very unusual for a transformer to overheat but occasionally a small manufacturing defect can, over time, cause overheating. This is the first time in the seventeen years of my tenure this or any other situation has caused a fire department response." Simpson Gumpertz & Heger completed civil engineering plans on Wednesday, 26 September 2012 for a Sutro Tower antenna additions omnibus package under commission 067199.06 and Sutro Tower site and erosion control improvements under commission 067199.07 for Sutro Tower, Inc. The antenna plans called for the relocation of the KOIT auxiliary antenna to Level 5 and the installation of fifty new antennas including a main antenna and STL for KREV 92.7 FM; six central receive antennas (for KTUV, KRON, KPIX, KGO, KNTV and KFSF) for news truck transmissions; two camera mounts and ten weather cameras for the same six television stations; an emergency antenna for KQED 88.5 FM; six dish antennas for the San Francisco Bay Area Wireless Enhanced Broadband (BayWEB) Project; fifteen WiFi antennas to provide wireless internet service to low income residents; a translator antenna for K205BM (KLVS 88.9 FM); broadcast antennas for KTNC-TV 14 and KEMO-TV 32; an auxiliary antenna for KTNC; and various microwave STL antennas. The site and erosion control improvements project plans called for the "installation of an approximately six-foot-tall, 62-foot long (1.83 by 18.90-metre) retaining wall southeast of the transmission building; implementation of a number of erosion control and drainage improvements on the site's southern hillside; installation of several exterior stairways and walkways along the southern fence line; repair, replacement, and widening of a portion of the existing sixteen-foot-wide (4.88-metre) driveway; and installation of a ground-level receive-only satellite dish antenna and 680-square-foot (63.17-square-metre) foundation to replace an existing smaller at-grade antenna." Reviews of the plans were made by Sutro Tower, Inc. on Wednesday, 28 November 2012 and Thursday, 31 January 2013. Another set of site and erosion control improvements engineering plans more detailed than the first were finalized by Kenneth N. Olcott with Sandis of Sunnyvale, California under commission 212121 on Friday, 15 February 2013. That same day, all of the plans were finalized and issued for permit. The San Francisco Planning Department case for the project is 2014.1377D and building permits 2013.04.12.4452 and 2013.04.12.4453 were issued. On Monday, 13 May 2013, Sutro Tower, Inc. scheduled a community open house meeting on Saturday, 18 May 2013 to discuss the plans. Sutro Tower, Inc. and Eric Dausman also hosted the community for Sutro Tower's fortieth birthday party, celebrated one day early on Wednesday, 03 July 2013. Broadcast engineers, tower staff and neighbors of Sutro Tower gathered starting at noon to enjoy a barbecue lunch and birthday cake. City Supervisor Norman Yee and former Mayor Willie Lewis Brown, Jr. were also in attendance, the latter of whom gave a short speech during the festivities. In addition, San Francisco Mayor Edwin M. Lee sent a proclamation declaring Sutro Tower Day as Thursday, 04 July 2013. The FCC held a meeting on Monday, 31 March 2014 to present its proposals for the television spectrum incentive auction and repackaging to broadcasters and consultants. Among the numerous provisions and rules proposed were deadlines to complete work after the FCC issues a channel change assignment table following the auction. Responding to reporter Phil Kurz in a story about broadcasters' concerns with the FCC's timetable, Eric Dausman gave an example of how local regulations can cause delays. "In San Francisco, which basically is under the California Environmental Quality Act, and in other states with rigorous environmental reviews of any permit request, there are many hoops to jump through to modify a structure," he said. During the week of Monday, 25 August 2014, routine maintenance work was performed on the antennas on Level 6 necessitating many stations to switch to their auxiliary antennas daily during the hours of 0900 to 1600 PT. Work was completed by the late afternoon on Friday, 29 August 2014. On Monday, 22 September 2014, Hammett & Edison completed an RF exposure impact analysis of the proposed new antenna installations and concluded that the modifications "will comply with the prevailing standards for limiting public exposure to radio frequency energy and, therefore, will not for this reason cause a significant impact on the environment." The report went on to note that "the highest calculated level in publicly accessible areas is much less than the prevailing standards allow for exposures of unlimited duration" and that these findings are "consistent with measurements of actual exposure conditions taken near this site" in previous years' studies. Hammett & Edison authored a supplemental RF densities report on Friday, 26 September 2014 that analyzed the potential impact to ground-level power densities as a result of increased antenna power capabilities established since the DTV conversion project and the planned addition of new antennas. This report concluded that "even with the proposed addition of two TV stations, two FM stations and an FM translator station, the calculated ground-level power density for normal operation of all of the radio and TV stations proposed for Sutro Tower would be more than ten times below the public limit." It also noted that "follow-up ground-level radio frequency power density measurements" would be taken after project work is complete to "establish actual post-modification levels … with thirteen TV stations, five FM stations and one FM translator station" operating. On Friday, 19 December 2014, the San Francisco Planning Department finalized an Addendum to the Sutro Tower Digital Television Project Final Environmental Impact Report originally certified by its commission on Thursday, 23 October 2008. The EIR addendum addresses the proposed improvements and modifications detailed in the engineering plans developed in 2012–2013 and explains the plans in detail, as well as reporting on the potential impacts of the project. The review concluded that no subsequent or supplemental EIR would be required for the proposed project modifications. "The proposed revisions to the project would not cause new significant impacts not identified in the FEIR, nor result in significant impacts that would be substantially more severe than those described in the FEIR, and no new mitigation measures would be necessary to reduce significant impacts," said Environmental Review Officer Sarah B. Jones in her conclusion. "No changes have occurred with respect to circumstances surrounding the proposed project that would cause significant environmental impacts to which the project would contribute considerably, and no new information has been put forward to demonstrate that the modified project would cause new significant environmental impacts or a substantial increase in the severity of previously identified significant impacts. Therefore, no supplemental environmental review is required beyond this Addendum." A public hearing (mandatory discretionary review) on the tower modifications and site work first announced for Thursday, 05 February 2015 was rescheduled to Thursday, 19 March 2015 to give the staff more time to the review the existing site "with respect to the applicable conditional use authorization." Including the building roof, Sutro Tower has six levels upon which the various antennas and other equipment are installed. Level 2 is 186 feet (56.69 metres) from the surface, Level 3 is 382 feet (116.40 metres), Level 4 is 557 feet (169.80 metres), Level 5 is 657 feet (200.30 metres) and Level 6 is 792 feet (241.40 metres). The remainder of the tower's overall height of 977 feet (297.79 metres) comes from the antenna stack rising above Level 6. Since 2009, Sutro Tower, Inc. has maintained an antenna status page that indicates whether the primary or auxiliary antennas are in operation as well as the tower and antenna configuration (some station call signs are currently out of date). 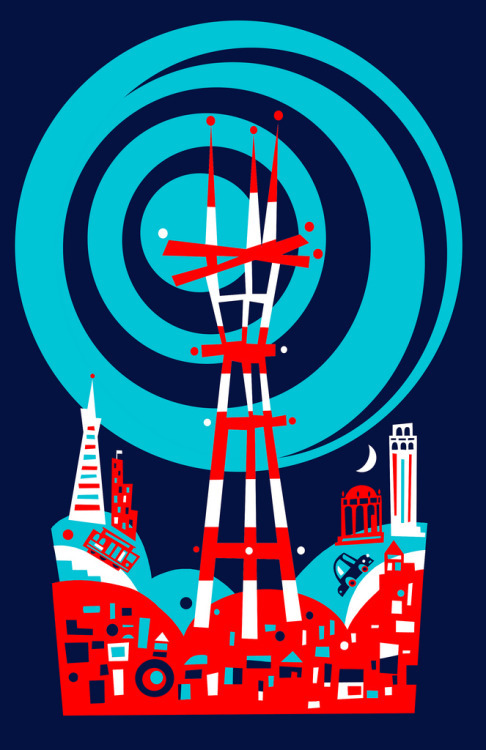 There are fifteen Bay Area stations — eleven digital television and four FM radio — transmitting from Sutro Tower. Each of those fifteen stations also maintains an auxiliary antenna lower on the tower. Approximately 200 other antennas are installed for a wide range of clients including telecommunication service providers and commercial services such as Sirius XM Satellite Radio, who operates a 15,900-watt terrestrial repeater (TR48) on Level 3. Government agencies including the California Highway Patrol, Federal Bureau of Investigation and United States Postal Inspection Service also have antennas. Additional equipment and antenna systems are installed on the building roof. Some of these antennas serve as a studio-transmitter link (STL), which allow television and radio stations to send audio and video signals from their studios to Sutro Tower for transmission, while others serve ancillary purposes. The Sutro Tower digital television (DTV) conversion project took place between January and November 2009. Transforming the functionality and appearance of the tower, the DTV project primarily consisted of removing analog antennas and installing new digital antennas. The changeover to DTV in the United States was driven by the Digital Transition and Public Safety Act of 2005, Title III of the Deficit Reduction Act of 2005 (Public Law 109-171, S.1932) enacted on Thursday, 20 October 2005. Digital television first came to the tower in November 1998 with the installation of a stacked ultra high frequency (UHF) antenna array between Level 5 and Level 6. The interim array consisted of four 32-foot (9.75-metre) antennas attached to a 125-foot (38.10-metre) vertical steel truss. This structure provided service to KRON-DT 4 and KBCW-DT 44 on Antenna 1; KGO-DT 7, KQED-DT 9 and KMTP-DT 32 on Antenna 2; KTVU-DT 2, KCNS-DT 38 and KCSM-DT 60 on Antenna 3; and KPIX-DT 5, KFSF-DT 66 and KOFY-DT 20 on Antenna 4. Installed at the bottom of this truss is the antenna for KSOL 98.9 FM, the only antenna scheduled to remain here after the DTV antennas are relocated to the stacks atop the tower. On Wednesday, 12 December 2007, Dielectric Communications of Raymond, Maine announced they signed a $1,750,000 deal with Sutro Tower, Inc. to complete a series of upgrades and enhancements over the following three years, including work to phase out analog television, install auxiliary digital antennas and move the primary digital equipment to the Level 6 stacks. Specific additions include TFU-WB wideband UHF slot cavity antennas, TFU-JSC/VP high-power pylon antennas, TUC and TUA wideband UHF panel antennas, combiners, transmission lines, high-speed wireless data services and additional components. As part of the city's review of the project (Planning Department Case № 2007.0206E, State Clearinghouse № 2008012005), a draft Environmental Impact Report (EIR) was published on Saturday, 17 May 2008 in advance of a public hearing on Thursday, 26 June 2008. The report contained an overview of the upgrades proposed, an environmental impact survey analysis, potential project alternatives and a review of mitigation measures. The comments and responses document released on Wednesday, 01 October 2008 contains summaries of oral comments made during public hearings and those received in writing during the Saturday, 17 May 2008 through Tuesday, 01 July 2008 public comment period. Local news stations also conducted interviews and published information to help inform the public. The planning commission certified the final EIR and approved the project on Thursday, 23 October 2008. The approval included a provision wherein Sutro Tower, Inc. must submit an executed agreement with several neighborhood associations prior to the expiration of the EIR appeal period. The Final Terms of the Agreement To Provide Information and Extend Certain Services To Sutro Tower Area Residents was entered into between Sutro Tower, Midtown Terrace Owners Association, Twin Peaks Improvement Association and the Forest Knolls Neighborhood Association on Friday, 07 November 2008. Work began in mid-January 2009, starting with the reinforcement of the tower to accommodate an auxiliary digital antenna array and construction of a rooftop equipment enclosure. On Wednesday, 21 January 2009, the first version of the DTV Delay Act, legislation pushing the digital television transition deadline from Tuesday, 17 February 2009 to Friday, 12 June 2009, was introduced in the Senate. Six days later, Eugene S. Zastrow suggested the delay could benefit broadcasters since backup digital transmitters were not yet installed. It was also noted that continuing to operate analog and digital simultaneously would keep the cost of electricity high for the stations. The DTV Delay Act passed the Senate on Thursday, 29 January 2009 and the House of Representatives on Wednesday, 04 February 2009. Agents of the stations broadcasting from Sutro Tower met on Thursday, 05 February 2009 to discuss how they would proceed. Since the legislation did not prohibit broadcasters from sticking to the original date or transitioning in the subsequent months before Friday, 12 June 2009, two Bay Area stations considered the option to cease analog operations. The next day, KGO-TV president Valari Staab provided an unconfirmed list to the San Francisco Chronicle indicating that KICU 36 (not at Sutro) had selected Tuesday, 17 February 2009 and KOFY 20 might transition Saturday, 21 February 2009. The bill was signed into law (Public Law 111-4, S.352) by President Barack Obama on Wednesday, 11 February 2009. Soon after, the FCC released an order on Friday, 20 February 2009 directing all stations planning to cease analog operations before Friday, 12 June 2009 to inform them of that decision by Tuesday, 17 March 2009. The auxiliary stacked UHF antenna array between Level 3 and Level 4 was installed and made operational in April 2009. This backup DTV array, used when the primary transmitters must be powered down, consists of two 47.6-foot (14.51-metre) antennas attached to a 160-foot (48.77-metre) vertical steel truss. This structure provides service to KOFY 20, KPIX 5, KFSF 66, KRON 4 and KTVU 2 on Antenna 1 and KQED 9, KMTP 32, KCNS 38, KCSM 60 and KBCW 44 on Antenna 2. In addition, KGO-DT 7 has an auxiliary very high frequency (VHF) antenna on Level 2. After additional reinforcement work in May 2009 to accommodate the new digital antennas, operations began on the three existing vertical mast assemblies. Extending 215 feet (65.53 metres) upward from Level 6, the solid round steel masts are made from A53 of A106 Grade B certified pipe fabricated by Lingo, Inc., of Camden, New Jersey. They are attached to the tower with an x-braced steel pedestal and secured by Phillystran, Inc. synthetic fiber guy wires. Removal of the KGO, KBCW and KOFY analog antennas on Mast B (southern stack) commenced in April 2009. On Friday, 12 June 2009 at 2359 PT, all analog operations were discontinued. The 40.5-foot (12.34-metre) antenna for KGO-DT was installed atop the mast in July 2009 followed by the 30.4-foot (9.27-metre) antenna for KBCW-DT added below it. Next, a gin pole was added to Mast A (western stack) in preparation for the Tuesday, 28 July 2009 removal of the KRON and KPIX analog antennas. The remaining KTVU analog antenna was removed from Tuesday, 04 August to Friday, 07 August 2009. These changes received attention by local observers, as the western mast's removal was plainly visible. Construction of the new 156.5-foot (47.70-metre) mast began around Wednesday, 12 August 2009 and was completed around Friday, 21 August 2009. The 64-foot (19.51-metre) KOFY-DT antenna was hoisted up to Mast A and side-mounted to it on Thursday, 27 August 2009. The bottom half of the combined KPIX-DT/KRON-DT/KTVU-DT antenna was installed on Friday, 28 August 2009 and the top half on Saturday, 29 August 2009. By Saturday, 05 September 2009, the guy wires were installed and the gin pole removed. Work started on Mast C (northern stack) the week of Monday, 07 September 2009, beginning with the installation of a gin pole and removal of the KQED, KMTP, KFSF and KOIT antenna guy wires. Removal of these antennas was completed by Wednesday, 16 September 2009. Most of the mast was then removed between Friday, 18 September and Sunday, 20 September 2009, followed by the construction of the new mast section and guy wires from Tuesday, 22 September to Sunday, 27 September 2009. The first section of the combined KQED-DT, KMTP-DT, KCNS-DT and KCSM-DT digital antenna was installed atop the new mast on Wednesday, 30 September 2009, quickly followed by the second section on Thursday, 01 October 2009, the guy wires on Friday, 02 October 2009 and the new KFSF-DT side-mounted antenna on Saturday, 03 October 2009. Part of the installation was performed by Seacomm Erectors, Inc. of Sultan, Washington. Around Thursday, 08 October 2009, the installation of additional transmission lines was completed. During the week of Monday, 12 October 2009, all stations broadcasted from their auxiliary antennas while the former main antennas were disconnected, the new main antennas brought online and tests conducted. All major work with regard to the eleven digital television stations was completed on Wednesday, 21 October 2009. In the following weeks, each station tuned their equipment by adjusting power levels and optimizing the signal. The final phase of the project included removal of any remaining analog auxiliary and interim digital antennas. By Saturday, 24 October 2009, the temporary DTV antenna stack installed in November 1998 was removed. During the following two weeks, the new KOIT-FM side-mount antenna was installed and the KOIT-FM temporary antenna, on the northern outrigger since April 2009, was removed. The digital television conversion project was completed on Friday, 06 November 2009. Larry Kenney took many photographs and provided notes during each phase of the conversion project. His excellent resource is split up into three sections by time frame. To receive over-the-air digital television, one must first choose a station from the stations transmitting from Sutro Tower. Most station websites provide answers to questions about tuning in and receiving their programming. Other available station listings include Bill Choisser and Larry Kenney's comprehensive HDTV Channel List and Wikipedia. Additional details on transmitters, stations, output power, signal strength and azimuthal coordinates are available from the FCC's DTV Reception Maps, TV Fool's Television Signal Locator, FM Fool's FM Radio Signal Locator and AntennaPoint's Transmitter Locator. For general information on digital television, antenna setup and other resources, refer to dtv.gov, Bill Choisser and Larry Kenney's Broadcasting: Yesterday and Today and the FCC Antennas and Digital Television guide. The following troubleshooting procedures are available to help scan for channels and resolve basic reception issues. Adapted from instructions provided by Sutro Tower, Inc. following completion of the DTV conversion project, these general procedures should also work for those outside of the Bay Area. As used below, the word "television" can also mean "converter box" depending on your setup. Consult your equipment's operating manual or official documentation for specific instructions and notices before attempting any maintenance. Activating the channel scan feature of a DTV-ready television or converter box will perform a search for available digital stations and save them to memory. This should be done periodically to ensure reception of all available channels and whenever new DTV equipment is installed. Some consumer products may do this automatically while others require manual input. Press "menu" on the remote control and choose the "channel scan" function. Repeat on all of your televisions. When the basic rescan procedure is ineffective, it may be necessary to reset your hardware. Disconnect the antenna from the television. Activate the channel scan function on the television without the antenna connected. Unplug the television from the electrical power outlet for two minutes. Reconnect the antenna to the television. Plug the television back into the electrical power outlet. Power on the television and activate the channel scan function again. Most digital television stations broadcast on the UHF band, so a quality UHF antenna is advised. Adjust the position of your antenna by slightly panning it horizontally. For indoor antennas, experiment by moving the antenna to a different location and then activating the channel scan function. Keep track of your results and try various locations to find the best spot. Problems have been noted in early generation digital equipment. If you have an older television and digital tuner or a converter box, consider replacing them with modern equivalents. Before spending money on solutions, ask your nearby friends and neighbors for assistance. They may have experienced similar issues and can provide their recommendations. Sutro Tower is not open to the public. The fenced-in private property is monitored and any trespassers will be detected, facing arrest and prosecution. Beyond photographs of private tours, close up views of the tower are available from public lands. The Summit Reservoir, a 14,000,000 gallon (52,995,800 litre) drinking water and fire protection resource built in 1954, is located to the immediate northeast of Sutro Tower and offers the closest views of the tower and building. A popular destination for local joggers, dog walkers and Sutro Tower fans alike, Summit Reservoir features a paved exercise path but no other amenities. Free street parking is available along Palo Alto Avenue and Marview Way to the north and east of the reservoir. In March 2004, the Summit Reservoir was targeted by the San Francisco Public Utilities Commission for a comprehensive rehabilitation as part of the Water System Improvement Program. The project (CUW30701) included seismic retrofitting of the east and west basins, roof slab and perimeter pier caps, in part through the addition of a reinforced concrete liner. Dedicated inlet and outlet structures were also constructed to resolve water circulation problems and the exercise path around the reservoir's perimeter was repaved. Construction was completed on Monday, 26 June 2006 and the reservoir placed back into service in August 2006. As of December 2010, construction phase expenditures for the project totaled $7,760,609. To see Sutro Tower from just a bit further away, nearby Twin Peaks offers that plus some of the best views of San Francisco. Accessible via Twin Peaks Boulevard, the popular Twin Peaks lookout on Christmas Tree Point Road may be a hit with tourists but offers a unique and sweeping view that just about anyone can appreciate. Trails also allow hiking up to the top of each of the Twin Peaks, where tourists are less likely to venture unless it is warm and sunny out. Free parking is available at the lookout, though it can be extremely busy during tourist season and on nice days. Two self-cleaning public toilets are also available. Twin Peaks is also home to the City and County of San Francisco's Central Radio Station. Providing communications support for government agencies, the Central Radio Station facility has one 180-foot (54.86-metre) tower ASR 1025293 (1977) and one 197-foot (60.05-metre) tower ASR 1064388 (1998). The city holds two FCC public safety pool conventional licenses with call signs KMK351 and KMA526. The Central Radio Station serves the city's police, fire, sheriff, emergency management and utilities departments; 911 dispatch system; the office of the district attorney; and the Unified School District, who runs public radio station KALW 91.7 FM. A live backup for the city's Outdoor Public Warning System also operates at the site. The capabilities of the Central Radio Station were put to the test in the aftermath of the Loma Prieta earthquake on Tuesday, 17 October 1989 at 1704 PT. Although the Central Fire Alarm Station's (CFAS) communications equipment, some of it antiquated, continued to operate at 1003 Turk Street without interruption despite a local power outage, the overloaded Computer-Aided Dispatch (CAD) system had to be partially shut down at 1743 PT. This meant that dispatches now had to be made on the fire department's five-channel radio system, already operating under overload conditions. That system's Motorola microwave transceiver at Twin Peaks continued in full operation during the event, as did other microwave and wireline systems. By midnight, the 911 communications center logged approximately 3,500 incoming calls in just under seven hours. On Sunday, 15 July 2012, police announced that vandals had broken into the facility and cut several wires. No essential services were disrupted and nothing was stolen, but the Federal Bureau of Investigation was notified nonetheless. A small, unpaved trail allows travel between Twin Peaks and the Summit Reservoir on foot, a path which is significantly quicker and more direct than following the roads. Exit from the northeast corner to Marview Way and turn right. Walk to the gated driveway for the open water Twin Peaks Reservoir on the left across from Farview Court. Take the small trail on the right side of the driveway before the gate. Hiking east toward the large tree, pass behind private residences on the right and the Twin Peaks Reservoir on the left. Once at the tree, pass the panel in the ground, hop the guardrail and carefully cross Twin Peaks Boulevard. Walk to the right and follow the dirt trail up to the Twin Peaks lookout. The trail ends at the westernmost part of the parking lot near a green trash receptacle, where the best views of Sutro Tower on Twin Peaks are had. Although a journey of only 1,580 feet (483 metres), please note that these unpaved trails are potentially hazardous with uneven terrain, narrow footpaths and proximity to various plants and animals (for example, foxes and raccoons). You are doing so at your own risk, so please explore safely and stay on public lands. "I keep waiting for it to stalk down the hill and attack the Golden Gate Bridge." The Twin Peaks Reservoir anchors the Auxiliary Water Supply System (AWSS), a city project that began development in 1908 following the great earthquake of 18 April 1906 and the subsequent destruction of much of the city by uncontrollable fires. The reservoir was launched into service on Thursday, 09 May 1912 when at 1300 PT, firefighters from Station №1 — then at Second and Townsend Street — started pumping in water from San Francisco Bay. Expected to take seven to ten days to complete, the reservoir was filled at a rate of 2,000 gallons (7,571 litres) per minute. With a capacity of 10,500,000 gallons (39,750,000 litres), Twin Peaks Reservoir was constructed with reinforced concrete six inches (15.24 centimetres) thick. As part of a high pressure auxiliary water system, the reservoir's elevation of 758 feet (231 metres) was originally envisioned by Fire Chief Dennis T. Sullivan in the 1890s. With its tank split between two equal bays, the reservoir is capable of functioning even in the event of a sudden break in the distribution system. Two 750 gallon per minute (2,839 litre per minute) centrifugal pumps deliver fresh water from the reservoir to the rest of the system. To the south of Sutro Tower and west of Twin Peaks is Sutro Reservoir 10-024, completed in 1952 and containing 32,000,000 gallons (121,100,000 litres) of potable water. Sutro Reservoir's tank is built into the side of Mount Sutro and features a topographically sloped concrete liner and walls forty feet (12.19 metres) high. In 2003, Lotus General Contractors of San Francisco and Sika Corporation of Lyndhurst, New Jersey completed a project to repair cracked, delaminated and spalled concrete on the 300,000-square-foot (27,871-square-metre) concrete lid and fix failed expansion joints. The reservoir was then refurbished and seismically stabilized in 2006 as part of the same program that upgraded the Summit Reservoir. At the southwest corner of Sutro Reservoir is the Midtown Terrace Playground and Sutro Recreation Center at 280 Olympia Way. Many webcams offering views from and of Sutro Tower have come and gone over the years. There is at least one camera on Sutro Tower in operation as of March 2015, but it is not publicly accessible. A monitor on-site does display the camera's video feed, which may be same as the one used by KGO 7. There are also plans to install ten additional cameras on the tower's northern and southern legs for use by the six local news stations. No word on if any of these cameras will be publicly accessible. The first "SutroCam" established on the tower and available online was built and installed by Timothy Požar in 1995. Požar was chief engineer for Sutro tenant KLOK/KKSF 103.7 FM from April 1984 to May 1996 and co-founder of one of the first commercial internet service providers, The Little Garden (TLGnet), in January 1990. KKSF was therefore the first commercial radio station to have a website; Požar launched it in October 1993. These same circumstances plus Požar being a self-described geek also led to the first SutroCam. After installing a digital studio-transmitter link (STL) between the KKSF studios and Sutro Tower, Požar realized that it could be used to get an internet connection at the transmitter site and thus, a webcam. He enlisted support from TLGnet co-founder John Gilmore — co-founder of the Electronic Frontier Foundation and co-author of bootstrap protocol (BOOTP) RFC 951 — an early employee at Sun Microsystems who loaned a spare SPARCstation 1 (Sun 4/60) with a video capture card. Požar next ran RG-59 coaxial cable between the transmitter rooms for KKSF and KGO, the latter of which had recently installed a camera on the tower from which they could capture images. The cabling in place, Požar connected it to the SPARCstation 1 and wrote code to take a snapshot from the video, save it to an image file and upload it to the KKSF website every five minutes via FTP over a fifty-six kilobyte-per-second line. Online from 1995 to shortly after May 1996, this was the first Sutro Tower camera on the web. The KKSF SutroCam went dark not long after Požar left the station; he next went on to be the first director of operations at the newly formed Internet Archive / Alexa Internet. Of his time working at Sutro Tower, Požar remembers that it was a great community of broadcast engineers. Employees from other stations were always willing to loan parts to anyone in a jam, allowed others to borrow their STL when one would fail and were known to "come running if you were off the air." Požar also recalls how transmission line and antenna malfunctions invariably occurred on rainy nights, when winds at the top of Sutro Tower can exceed one-hundred miles per hour. In the worst weather, workers could seek temporary shelter in a painter's shack that used to be on Level 6. "A nice memory of working at Sutro Tower was taking the elevator to the top on summer days when San Francisco would be fogged in. We would be out in the sun, our feet hanging over the grate, with the ocean of fog rolling under us." From at least November 2001 through May 2004, KGO ran a setup similar to Požar's with stills from their camera's video feed captured and uploaded to their website. The last known publicly accessible image from the KGO Sutro Cam is a blue screen from Thursday, 06 May 2004 at 0941:51 PT (pictured below). My long-time favorite City Birds Cam was forced to take their webcams offline on Saturday, 27 March 1999 after site operator J. David Pfister's low-cost internet service was discontinued. Pointing up at Sutro Tower from the window of a nearby building, the Powazek SutroCam operated during 2000 but froze on Tuesday, 05 December 2000 at 1035:21 PT and never returned. Online since at least Friday, 19 March 2004, the WeatherBug Twin Peaks Cam was last updated on Thursday, 28 July 2005 at 0940 PT showing that day's foggy vista until late 2011. Jeffrey and Ashley Bennett provided neat time-lapse images of Sutro Tower and Twin Peaks from their window from Wednesday, 24 November 2010 until they relocated on Monday, 01 August 2011 to Minneapolis, Minnesota. Internet service provider MonkeyBrains streamed video of fog, Sutro Tower and Twin Peaks from their roof at sutro-cam.monkeybrains.net starting on Saturday, 25 August 2012 but it was since deactivated. Not to be confused with Twin Peaks in San Francisco, there is also an unincorporated community called Twin Peaks — population 2,534 (2010) — within the San Bernardino National Forest about eighty miles (128.70 kilometres) east of Hollywood. From an elevation of 5,715 feet (1,742 metres), Michael W. Richmond (WA6TJQ) operates several webcams and weather station AR725, which provides live meteorological data to the National Weather Service every five minutes or so. At 908 feet (276.8 metres) and to the northwest of Sutro Tower in the center of San Francisco, Mount Sutro is one of the seventy-four hills within the city. Like the rest of the surrounding landmass, Mount Sutro is part of the Franciscan Complex sometimes called the Franciscan Assemblage — an area of distinctive rocks ranging in age from about 200 million to eighty million years old that make up an accretionary wedge formed in a San Andreas fault system subduction zone. The Franciscan Complex "primarily consists of graywacke sandstone and argillite" but also contains amounts of "greenstone, radiolarian ribbon chert, limestone, serpentinite and a mixture of high-grade metamorphic rocks." The topography of Mount Sutro is mostly made of greenstone (altered submarine basalt) and chert. It is "capped by a highly fractured and weathered chert formation which tilts steeply downward in a westerly direction," according to a Friday, 21 January 1966 soil and foundation survey report conducted by Dames & Moore of Los Angeles, California. First appearing on maps in 1833 as Blue Mountain, Mount Sutro's history of names has been thoroughly researched by amateur historian Dan Schneider. The original Blue Mountain designation was given by Captain Frederick William Beechey (1796–1856) of the British Royal Navy during a charting expedition in 1827. The reason for this appellation is unclear, but Schneider notes that christening things "blue" was popular at the time. The 1,200 acres (485.60 hectares) of land surrounding and including Blue Mountain was granted to José de Jesús Noé as Rancho San Miguel after he, as Mexican alcalde of Yerba Buena, petitioned the Governor of Alta California in a letter dated Sunday, 18 May 1845. For a time, the triad of Blue Mountain, Twin Peaks and Mount Davidson were known together as the San Miguel Hills. Blue Mountain was later unofficially renamed Mount Parnassus in 1879 when the Rancho San Miguel was purchased by Adolph Heinrich Joseph Sutro (1830–1898), a successful engineer, businessman, real estate investor and politician. When the Sierra Club decided to christen the peak Sutro Crest in 1910, daughter Dr. Emma Sutro Merritt objected because "it was not indicative of the place or befitting enough for her father." It was she who suggested the alternative name Mount Sutro to the Sierra Club and in 1911 that name was made official. Adolph Sutro lived in his birthplace Prussia until 1850 when he moved to the United States and then to San Francisco, arriving on Friday, 21 November 1851. Over the next ten years, he built a relationship with Bank of California founder William Chapman Ralston and eventually designed, promoted and built (1860–1878) what would be known as the Sutro Tunnel. The tunnel was designed to drain water from the Comstock Lode silver ore mine under present-day Virginia City, Nevada (near Carson City and Lake Tahoe) approximately 3.84 miles (6.18 kilometres) as the bird flies to an exit point in Sutro, Nevada just north of modern Dayton, Nevada. Moving back to San Francisco in 1879, Sutro began making large real estate investments in locations like Mount Parnassus, Mount Davidson and Lands End. Sutro went on complete several projects which, in addition to the Sutro Tunnel, are probably his best known works. In celebration of Arbor Day in November 1886, he had thousands of trees (mostly Bluegum eucalyptus) planted on Mount Parnassus and the surrounding lands he owned. The following year, he was successful in having Seal Rocks designated as a wildlife preserve to protect the colony of Steller's sea lions (Eumetopias jubatus) and California sea lions (Zalophus californianus) living there. In 1894, Sutro developed "an ocean pool aquarium among the rocks north of the Cliff House" in part due to his "special interest in natural history and marine studies." This was then expanded into the Sutro Baths, a three-acre (1.21-hectare) public bathhouse that opened on Saturday, 14 March 1896 as the largest indoor bathing facility ever constructed. Simultaneously, Sutro somehow managed to find time to run for office and on Monday, 07 January 1895, he started a two-year term as the twenty-fourth mayor of San Francisco as a member of the People's Party (the 1891–1908 "Populists"). The Tuesday, 13 August 1895 edition of The San Francisco Call detailed a forthcoming lawsuit against Adolph Sutro and other area land owners by the heirs of José de Jesús Noé, who claimed that the conveyance of Rancho San Miguel to W. J. Horner in 1853 was illegal. A year later on Wednesday, 09 September 1896, the San Francisco Examiner reported that judgment in the case had been rendered in favor of the defendants on the day prior. Near the summit of Mount Sutro is the site of a former control area for the U.S. Army's Project Nike anti-aircraft missile defense system. Nike missile site SF-89C at Mount Sutro worked in concert with Battery Caufield site SF-89L, missile launch pad and headquarters for the 740th AAA Battalion at Fort Winfield Scott on the Presidio. Starting development in 1945 and going operational in 1953, Project Nike would operate up to 280 batteries nationwide until 1979. SF-88L at Fort Barry in Marin County was decommissioned in 1974 and subsequently transformed into a public museum operated by the National Park Service. Located in the heart of the city, Mount Sutro is surrounded by several residential neighborhoods. The southeast corner not far from the summit is home to the University of California San Francisco (UCSF) Aldea San Miguel housing complex along Behr Avenue and Johnstone Drive. Occupying the southern and southwestern sides of Mount Sutro, the Forest Knolls community exists east and north of Warren Drive, south and west of the Mount Sutro summit and west of Sutro Tower. South of the tower is Clarendon Heights and the community of Midtown Terrace, established in 1957 and consisting of 817 residential homes. Mount Sutro is bounded on the west by Clarendon Avenue south of the Twin Peaks Boulevard intersection. Winding counter-clockwise along Laguna Honda Boulevard, Woodside Avenue and Portola Drive, the southern border meets Twin Peaks Boulevard in the southeast and follows the Boulevard north to Clarendon. Bordering the southeast corner of the UCSF campus lays the Interior Greenbelt, an urban forest featuring various bird and sensitive plant species. Just north of the forest is the small and scenic community of Parnassus Heights. For many years, the surface of Mount Sutro has been undergoing a botanical restoration led by UCSF, owners and custodians of the 61-acre (24.69-hectare) Mount Sutro Open Space Reserve. UCSF, whose medical center is located to the north of the reserve, has the support of several volunteer groups including the Sutro Stewards and the California Native Plant Society. This partnership has worked to restore public trails — such as the Western Ridge trail believed to date to about 1906, but hidden for years by the brambles, flora and fauna — remove non-native species and repopulate indigenous plants. In 2003–2004, UCSF received a $100,000 grant from the Rotary Club of San Francisco to develop a native plant demonstration area on the summit of Mount Sutro. Volunteers with the Rotary Club were meeting at Mount Sutro monthly to work at the site. Other volunteers also meet on the first Saturday of the month to maintain and improve the existing Mount Sutro trail network; remove and prune invasive blackberry, ivy and weeds; and help sustain native plants in the summit garden demonstration area. In May 2009, UCSF announced that they had obtained preliminary approval for two Federal Emergency Management Agency (FEMA) grants totaling $337,560 for two fire mitigation projects within the Mount Sutro Open Space Reserve. The South Ridge project area was comprised of eight acres (3.24 hectares) to the immediate west of the UCSF Aldea housing facility and the Edgewood Avenue project area was comprised of six acres (2.43 hectares) in the northeastern section of the reserve. The proposal called for the removal of dead and live vegetation by means of "goat grazing, mechanical clearing, hand-clearing and chemical application." The blue gem eucalyptus and Himalayan blackberry were specifically targeted, however UCSF said that it would work with scientists to determine which species should remain and the exact amount of vegetation to be removed. Thereafter, approximately 225 native and more fire resistant species of trees will be planted along with grasses and wildflowers. In response to criticism of the plan from some local residents, UCSF addressed specific concerns on Thursday, 09 July 2009 and announced they would delay the project in order to hold additional public meetings. Opponents of the plan like Save Mount Sutro Forest and the San Francisco Tree Council claimed that fire mitigation is simply an excuse to remove non-native species and believe the risk of fires will actually increase. Organizations supporting the UCSF plan included the Sutro Stewards, SF Urban Riders, the Rotary Club of San Francisco and the Cole Valley Improvement Association. On Thursday, 25 February 2010, UCSF announced that they were withdrawing the FEMA grant applications because their timelines would not permit the creation of demonstration areas as necessary per the Mount Sutro Open Space Reserve Management Plan published on Friday, 28 September 2001. The Environmental Impact Report (EIR) required by FEMA, which would take two years and place a moratorium on any mountain work, was also cited as a reason for the withdrawal during a Wednesday, 24 March 2010 community meeting. UCSF's new plan called for a yearlong California Environmental Quality Act review, the development of a two-acre (0.81-hectare) demonstration area and the continued involvement of interested residents through a series of community workshops. According to the new plans , work on the demonstration area would begin in September 2011. On Friday, 18 January 2013, UCSF released a new draft EIR that addressed "thinning of the forest, removal of some invasive shrubs and vines, native plant restoration and construction of new trail linkages." UCSF then published a frequently asked questions document on Wednesday, 20 February 2013 in advance of an EIR public hearing on Monday, 25 February 2013. In addition to Save Mount Sutro Forest and other advocacy groups against the UCSF plans, the San Francisco Chronicle published an editorial by Joseph Mascaro against the plan as well as a story about the controversy. Other media outlets covering the story included Huffington Post, The Epoch Times and Synapse, the UCSF student newspaper. At the same time, an unrelated project to test the effectiveness of goat grazing in the Mount Sutro Open Space Reserve was set to begin, but was postponed on Monday, 04 March 2013 until later in the year due to bird nesting season. In addition, the San Francisco Planning Commission approved a plan on Thursday, 07 March 2013 to build thirty-four new homes on the west side of Mount Sutro. On Thursday, 21 November 2013, UCSF held a meeting wherein yet a new plan for Mount Sutro was announced. The plan's components included a revised objective focusing on the safety of people and structures without native plant restoration; a reduction in area to twenty-five acres (10.12 hectares); a significant reduction (about 3,700 down from 27,000–30,000) in the amount of trees to be removed; and a statement that no pesticides would be used. UCSF was to complete a new EIR for this plan, but on Thursday, 06 March 2014 they announced their decision to postpone this indefinitely due to staff workloads with the Long Range Development Plan (since completed late in the year). Vice-Chancellor Barbara French said that routine maintenance such as "cutting back bushes and dealing with hazardous trees" would continue, but the new plan was on hold pending the approval of an EIR. Regardless, UCSF did cut down about 1,200 trees in August 2013 for "urgent fire safety work" and another 212 trees declared as hazardous in March and May 2014. As of Wednesday, 31 December 2014, there was no further movement on the EIR or plan. During the Wednesday, 04 March 2015 meeting of the UCSF Community Advisory Group, it was announced that eight standing dead trees would be cut down the following day in advance of a Sutro Stewards trail work event for International Women's Day. About 100 volunteers were expected to come to work on a section of the Gardeners Trail between the South and West Ridges of Mount Sutro. UCSF also announced that they hired Morgan Vaisset-Fauvel, a certified arborist formerly of Bartlett Tree Care, but did not address the pending EIR or plan. Whenever I find myself discussing Sutro Tower and sutrotower.org with people I encounter, "why" is a question frequently asked of me. I do not look forward to that particular question, because even I do not really know the answer. My personal fascination with Sutro Tower and Mount Sutro started during my first visit to the city in 1989. I was with my family on one of our summer vacation cross-country road trips and like so many others, could not help but notice the large antenna tower in the middle of the city. Perhaps it helped that even then I had an interest in technology, computers and radios — I received my amateur radio license KD4PGJ in 1992 — but for whatever reason Sutro Tower made an impact. My first trip to the Twin Peaks lookout was especially memorable because of the great view of the tower there. Beyond just seeing the tower while about the city, there was an additional experience that I think helped cement my interest. During a visit to the Exploratorium (then at the Palace of Fine Arts), we came across an interesting film-based exhibit called Golden Gate Fly-Over (1987) directed by Michael Naimark. The film was shot at 1,000 feet (304.80 metres) above sea level using a special gyro-stabilized camera attached to a helicopter as it mapped a grid of precisely ten square miles (25.90 square kilometres) from the Golden Gate Bridge. Instead of simply watching this film, the exhibit's trackball allowed guests to fly quickly above the city creating "a hyper-real experience, something impossible to experience in the physical world." When it was my turn, I used the trackball to move through the city toward Twin Peaks and before I knew it, I was staring at Sutro Tower on the screen like I was hovering next to it. This was a pretty remarkable experience for a technology-inclined eight-year-old in 1989, a time when Tim Berners-Lee was just developing what would become the World Wide Web and give rise to modern variants of this like Google Earth. Over twenty-five years later and 2,227 miles (3,584 kilometres) away, San Francisco and Sutro Tower continue to be a part of my daily life. Thanks to this site, I regularly receive email from visitors with personal stories about how and why Sutro Tower is significant to them. Some kind people have also mailed me their Sutro Tower works of art, models and T-shirts. Social media and other San Francisco websites also provide vicarious local experiences. Hanging on my living room wall is a Twin Peaks Boulevard street sign that once stood in the shadow of Sutro Tower. I purchased the used sign at the San Francisco City Store in 1996 (the city store closed in 2004). Below it is a copy of my custom MT SUTRO Florida license plate, first issued to me in late 2001 and on my car today. The most visible item in my home is certainly the beautiful, hand-crafted Sutro Tower coat rack by Justin Godar that I received in April 2014. I am proud to own the easternmost of these irresistible creations and although I was unable to attend the event itself, my name was inscribed on the Sutro Tower coat rack set alight on Ocean Beach by Godar on Sunday, 04 May 2014. When this site launched in 2001, the Links section documented the few other places with Sutro Tower information (basically three at first). This became increasingly difficult over time and today, Sutro Tower is discussed, documented and photographed all over the place. As such, with a few exceptions the topics now contain representative works, my favorites and items sent to me. Greeting Card by Giant Gnome Paper Co.
Holiday Ornament by Sutro Tower, Inc.
Pet Bowl by Sutro Tower, Inc.
Tattoo III Elly Jonez, et al. Sutro Tower Stout by Local Brewing Co.